Ted at High camp on Everest. Eulogy written by Shona and friends. Ted was born in Newcastle, the son of a miner and draftswoman, and was brought up with his brother, Colin and sister, Gail in Nottinghamshire. This was where he joined the Air Training Corps, squadron 2425, and where he caught the climbing bug, exploring the rocks of Derbyshire. He maintained close links with the squadron and latterly served as a Reserve Officer with a remit to teach and train cadets. Despite going onto achieve great things, as Ted himself often said, he left school with only the cane marks on his backside. He joined the Royal Air Force at the age of 17, when he trained as a mechanic, and whilst serving at RAF Gutersloh in Germany, was boxing champion in 1982. He joined the RAF Mountain Rescue Service as a volunteer in 1979, and served on teams at RAF Leeming and Kinloss. Thereafter, mountaineering, in all its forms, became a dominant force in his life. He was an avid rock climber, and later, in Scotland, discovered what would become his lifelong passion, winter climbing. During this period, he was one, of a two- man team which made the first RAF ascent of the North Face of the Eiger. From the Alps, Ted moved onto the Himalayas, and in 1983 was part of the team which completed the first British ascent of Manaslu. In 1983 he joined the Brabrant Island Joint Services expedition, a number of members of which, are with us today. This involved him spending a year exploring Antarctica, where he was a skidoo mechanic, mountain leader, surveyor and cartographer, making maps of previously unmarked territory. He also made 28 first ascents of mountains on the island. For his work there, he was invested with the Polar Medal by Her Majesty the Queen. This was followed by a period of service with the Royal Navy on HMS Endurance, principally as a marine engineer, but also serving with the Royal Marines as their Mountain Leader. In this role he was awarded his coveted ‘Green Beret’ for work with the Marines on an Antarctic rescue mission where he led one of the two detachments. 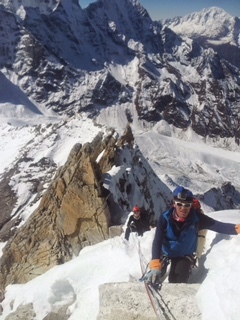 In the midst of all this, he somehow found time to train as a hang glider pilot!In 1988 Ted was part of a team which climbed the West Ridge of Everest. 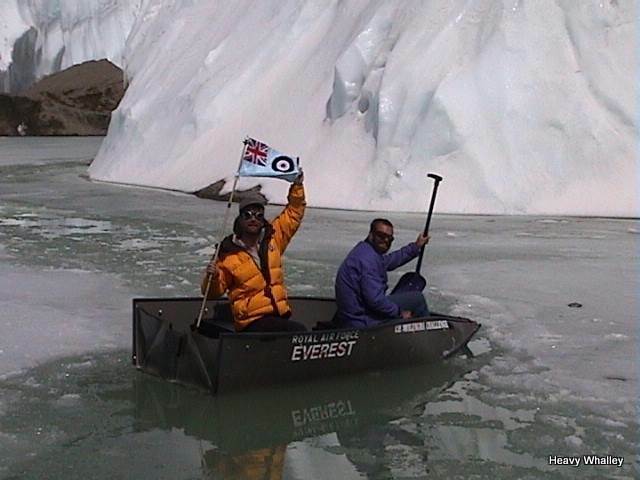 Whilst this expedition did not reach the summit, this is where he became involved in the use of oxygen,and where the seeds were sewn for the RAF Everest Expedition in 2001. In 1991 Ted married Shona, in this very church, and they floated off happily into the sunset for a posting in Cyprus. During that time, Ted qualified as a ski instructor in Alpine and Nordic disciplines. Shortly after returning from Cyprus, Ted took his commission, and not long after that, in 1987, was a Climbing Leader on the Gimaghella expedition which established a new route and completed the first British ascent of the mountain. 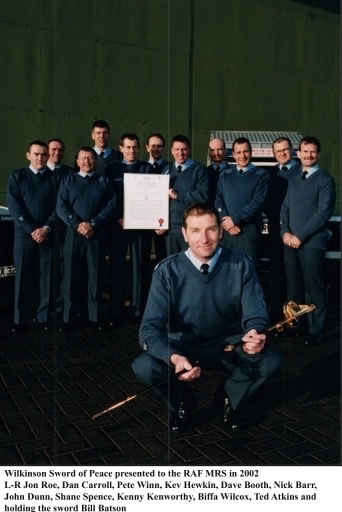 He then worked on Nimrod and Tornado jets, before being appointed as Staff Officer RAF Mountain Rescue Service in charge of the teams in Scotland and the North of England, and it was in that role, in 2001, that he led the first RAF team to summit Mt. Everest. During that expedition, he also set a world record for the highest ever boat ride by sailing at over 20,000 feet in the glacial lake just below Advanced Base Camp. Lewis, Ted and Shona’s son, whom Ted described as “the biggest achievement of my life” was born in 2002, and their little family was complete. RAF Mountain Rescue Service personnel and the Mountain Rescue Association members at the 70th Anniversary Dinner to celebrate 70 years of saving lives. Rescue HQ. 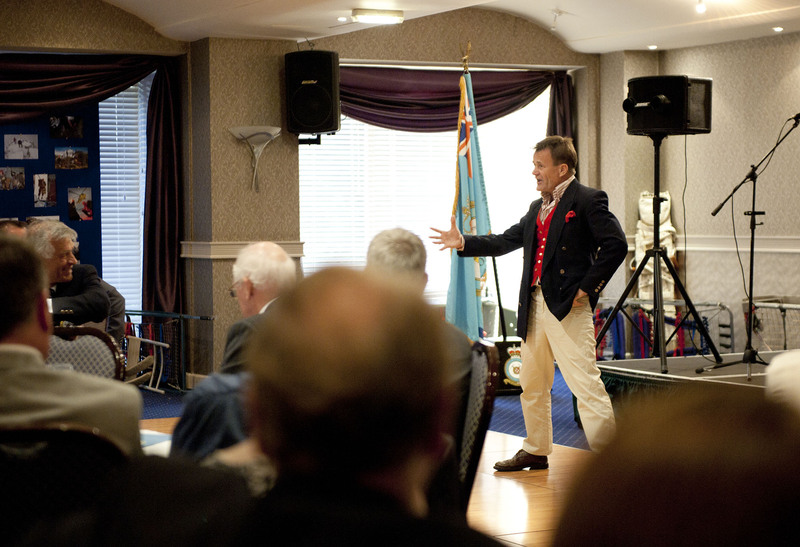 The guest speaker on the night was ex Mountain Rescue Leader Ted Atkins who famously walked up Mount Everest and retold his memoirs to an amazed audience. 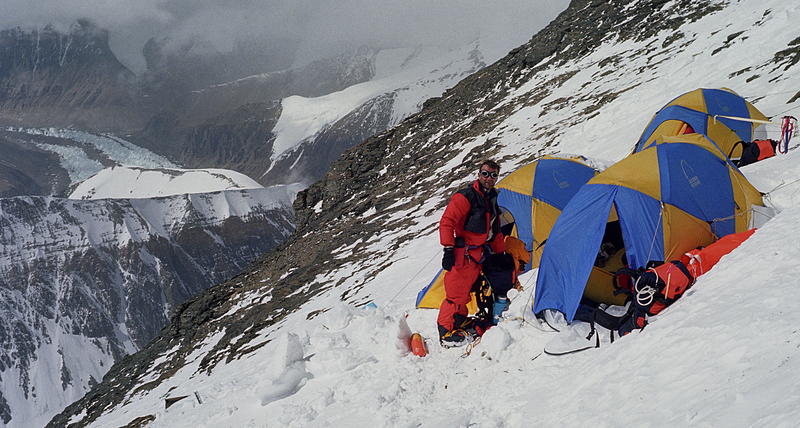 In 2004 Ted returned to Everest to climb from the South in Nepal, this time without a team. His attempt was successful due largely to the new oxygen system he designed, developed and then went on to test as he climbed. He took a Tornado pilot’s mask and some fittings, with no sure idea of the end product, and sitting outside his tent with all of these bits in front of him, the idea came. The basis of his invention was a condom and coke bottle. Doubters predicted that he would die. In fact, after reaching the summit he nearly did die, but not because his mask had malfunctioned. Part of the oxygen supply he had expected to be delivered did not turn up during his ascent, causing him to run out of oxygen on the summit, when he began to develop hypoxia. Other climbers left him for dead, one even blogging news of his death by satellite phone, which was reported on the internet. However, Ted’s life was saved by a 25-year-old Sherpa called Mingma, who gave him his own oxygen cylinder. Despite this hiccup!! the speed of Ted’s ascent had been noted by other climbers and he was asked by a mountaineering expedition company to make a commercial product, though without using condoms!! In 2006, Ted and his family decided to move to France, and in 2007, after 33 years of service, Ted left the RAF, as Chief Engineer on Sea King Search and Rescue helicopters. His final deployment in the RAF however was that of Project Officer with the SAS for a 100% successful ascent of Everest. Ted set up business in Nepal and continued to develop and improve the oxygen systems used on Mt Everest and other high mountains. At that time, it was estimated that 1 in 10 people died attempting to climb Everest. Some years later Ted received a letter from the Nepalese Mountaineering Association thanking him for reducing the death rate from 1 in 10 to less than 1 in 700. The Topout system was firmly established. He, then went on, along with Dawa, his Nepalese business partner, to build a plant to produce oxygen in Nepal in order to guarantee the quality of the oxygen supplied by Topout. A request to work with the Everest Skydive Team was taken up to give them a better oxygen system for jumps exiting aircraft, level with the summit of Everest. This was an outstanding success. The Topout Aero skydive system went on to become the industry standard some years ago, and a number of world records have since been set. As part of this new work Ted trained as a skydiver. Following his ascent of Everest, Ted went onto climb Kangchenjunga (the 3rd highest mountain in the world), Lhotse (the 4th Highest), and Makalu (the 5th highest), along with Lobuche East, and Ama Dablam. Ama Dablam was unique in that he parachuted into Base Camp setting a world record as one half of a duo that landed a tandem parachute jump on ground 15,000 ft above sea level, before he went on to climb the mountain. All of this led to requests to work with some of the great and good including the Red Bull skydiving team on a project on Mt Blanc, and this year,the team which produced the recently released Mission Impossible film. In Nepal Ted was involved with several charity organizations including the Duke of Edinburgh award scheme, was a trustee of an orphanage, and wrote a regular column in the Nepali Times. In 2014, Ted, Shona and Lewis moved to Alleghe, a beautiful village in Italy, where they were warmly welcomed into the local community. Many people all over the world have paid tribute to Ted. A close friend in Italy said “Without men like this, who push the boundaries and limits of what is perceived as possible, Neil Armstrong would never have stepped foot on the moon. Some might think that mountain climbers are simply adrenaline junkies but it’s not that at all. Encapsulated in some people are concentrated human characteristics that have allowed mankind to cross boundaries of exploration and science. Without men like Ted Atkins, the human race wouldn’t be what it is today”. However, all of this tells you only what Ted did, not who he was. So, what were the characteristics of that person, Ted Atkins? He has been described as:“a man who showed us how to live!” A great friend, energetic, passionate, warm, heartfelt, kind, but also humble”. However, ultimately Ted was much more than the sum of all these parts. For those of us gathered here today, he was a much -loved brother, uncle, son-in -law, husband, father, and friend. It is for these reasons, above all, that we have come together today to celebrate his life, and that his memory, and so his spirit will remain with us eternally. ‘Death is not so important. Ted finished his article by saying “What do we leave behind? Did we make anything better? What will our children say about us? Without doubt Ted Atkins left a huge mark on the world, and that’s what it’s all about. This entry was posted in Articles, Expeditions - Alaska - Himalayas etc, Friends, Mountain rescue, Mountaineering, Rock Climbing, Scottish winter climbing., Views Mountaineering. Bookmark the permalink. Wonderful words for a great man. Stunning achievements by a great guy. Rest in Eternal Peace Ted, was an honour to have known you. Great eulogy Heavy. Didn’t know Ted – but some cheil, eh! Wonderful words for a great Gentleman. It was an honour to have known you Sir. R.I.P. I never knew or served with Ted, but I wish I had. R.I.P. Very well written Heavy. I can appreciate the effort and emotion you put into that piece. Well done. I am so gutted to have missed saying good-bye to Ted. Sounds like a helluva send-off ! We will all miss Ted. He epitomised what a full life is really all about. Ted was a true follower of the Colin McRae school of thought – “In it for a fun time, not a long time!”. Thanks Gerry very kind of you ! Just back in the UK and heard the news. I’ll be raising a glass to a great man. I dug out an old photograph of Ted. He’s standing (ever so fashionably in pair of purple shorts, singlet and big ol’ plastics) outside the Schonbielhutte with the North Face of the Matterhorn dominating behind. Tim Sugars and I had just endured a 21hr epic (snowfall, storm, jammed ropes) and neither of us were in the mood for committing to another route. A beer or several maybe but a route? Nah. It didn’t go but In the end his salesman pitch delivered with his trademark exuberance managed to win over Tim and they ended up tackling the Zmutt ridge. I spoke to him a couple of times about TopOut and bumped into him in Cham. He was always so positive about what you wanted to do and with a twinkle in his eye about maybe, just maybe joining you. There was always the, “but have you thought about…” Going bigger, that was Ted to me. I have nothing but happy memories of any time I’ve spent on the hill with Ted. Truly a trademark of a great man. I’ll be back in Zermatt March through April… maybe it’ll go Ted, maybe. Thanks for that Dutch !